Tracy Ellis, a volunteer at Ridgecrest Elementary, is the 2018-19 Florida Outstanding Volunteer of the Year for Region IV, Adult category. The announcement was made last week by Education Commissioner Richard Corcoran. “This award recognizes your contribution to the academic success of students and your commitment to fostering a positive learning environment in our schools,” Commissioner Corcoran wrote. 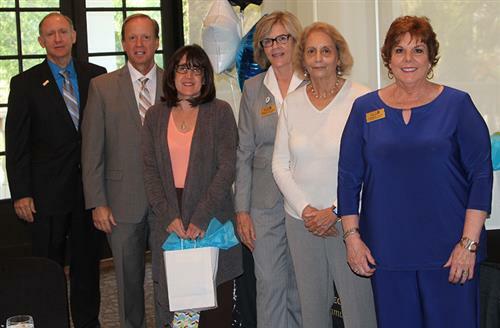 “Your dedication to serving as a school volunteer has made a considerable difference in the lives of many Florida students, their teachers, and your community." Ellis has been a valued member of the Ridgecrest Elementary School learning community for more than six years. During this time, she has served in numerous parent-led leadership positions such as PTA president and Student Advisory Committee chairperson. She has spearheaded school projects, sponsored a school club, facilitated parent workshops and events, and has been a true champion advocating for children who come from disadvantaged backgrounds. As PTA president, Ellis volunteered many hours organizing the Walk to School Day, a Staff Appreciation Luncheon, created a Parent Calendar/Handbook, sold school Spirit Shirts, and maintained the PTA website and Facebook page that provided the Ridgecrest school community with timely communications. Ellis also sponsored the Ridgecrest Debate Club for two years which provided more than 70 students with opportunities to learn valuable research, presentation and leadership skills. She also volunteered time supporting the Panther Pals Reading Mentor program which provided struggling readers in grades K-2 with a caring adult reading buddy. Pictured: Tracy Ellis when she was named the district's Outstanding Volunteer winner for the adult category last year. Last week, Ellis was named Florida's Region IV adult category winner.